As the highest peak in Massachusetts, Mt. Greylock has a rich skiing history. In addition to being home to one of the countries oldest ski areas (the Mt. Greylock Ski Club on the west side), it is also home to one of the most storied alpine ski trails - the Thunderbolt. Decades later, Mt. Greylock was considered for a potentially massive ski area development. The first noted tramway proposal was in 1941. While this proposal failed to gain approval, Governor Herter set up the Mount Greylock Tramway Authority in 1953, with the aim of obtaining private funds to develop an $2.7 million aerial tramway-serviced ski operation. The objective of the development was to help the town of Adams by replicating New Hampshire's Cannon Mountain tramway. At one point, Sel Hannah surveyed the proposed area. In 1964, the $5.5 million dollar plan on the table by Fay, Spofford, & Thorndike, Inc. of Boston included 4 chairlifts and an aerial tramway. 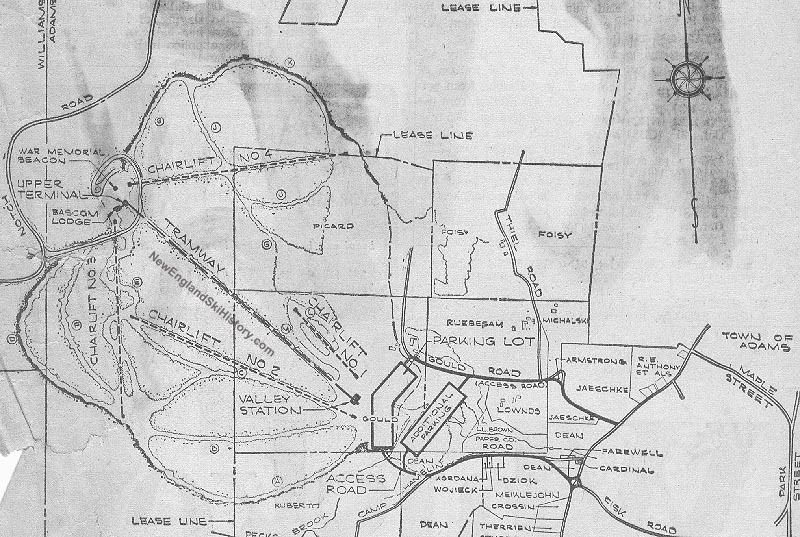 By 1966, the plans had grown to include 3 chairlifts and an aerial tramway for a first phase and three more chairlifts, a shopping center, hotel, and golf course for a second phase expansion. After just over half a decade, not enough bonds were sold to finance the project. The final nail in the coffin of the Mt. Greylock tramway proposal was hit when the Massachusetts Supreme Court abolished the Mount Greylock Tramway Authority in 1966. 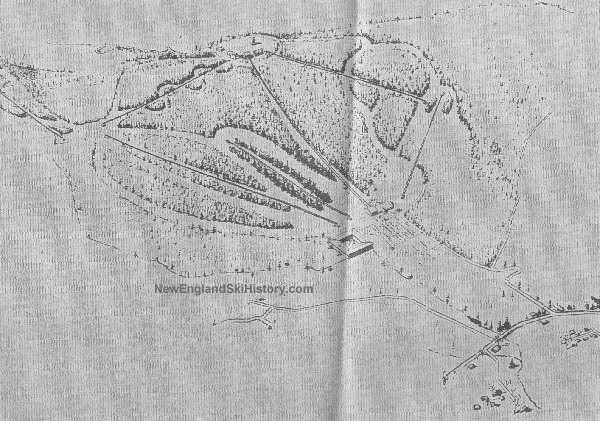 The Saddle Ball Ski Area project was subsequently planned by a private developer, followed by Greylock Glen. While there are no remains of the Mt. Greylock Ski Area, much of the subsequent Greylock Glen development remains.
" Gov. Christian Herter of Massachusetts has appointed a five-man committee in Berkshire County to advise him on the potentialities of constructing an aerial tramway to the summit of Greylock. It would be similar to the one which services Cannon Mountain in Franconia, NH. Several steel companies have looked over the proposed sites on the east side of Greylock and have turned in blue prints on suggestions for a tramway to accommodate 400 persons an hour, winter and summer." "
" The passage of an amendment to a Greylock hunting and fishing bill threw the entire state into turmoil, however, when in the final days of the 1959 Legislative session the state's financial backing was pledged to the tramway. Opponents immediately attempted to have the State's Superior Court declare the amendment illegal. Other solons filed bills to nullify the action on the basis that it would set a precedent for the Massachusetts Turnpike Authority and other groups seeking state backing. To answer the blasts of his critics, Governor Foster Furculo appointed a 13-man conservation advisory committee to the Tramway Authority, naming both supporters and detractors to the group. Members included ski movie maker John Jay and ski writer John Hitchcock. The new policy of the reservation commission became apparent when Supt. Charles L. Parker, a charter member of the Mount Greylock S.C. and one of the persons laying out Thunderbolt, declared that a ski development to rival anything in New England could be established on the Saddle Ball area of Greylock, just south of the proposed tramway. He envisioned a multi-chairlift area with a vertical drop of nearly 2,000 feet, capable of serving 6,000 to 8,000 skiers a day. 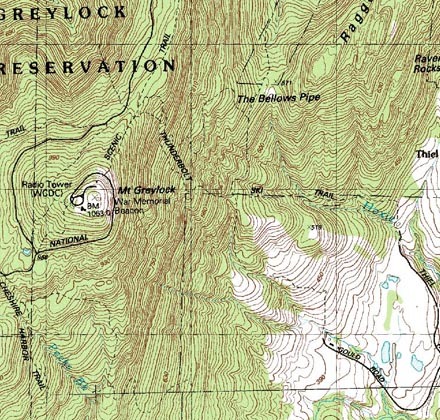 The Mount Greylock S.C. passed a resolution against the tramway, in its proposed location, as a ski lift, and suggested that the area to the north was the only place for a ski center. Oddly enough, even with the contested state backing, no announcement has been made of the sale of bonds. It is expected that another bill will be filed, limiting the state backing to three-and-one-half million dollars. With the support of Governor Furculo, who says the declining textile mill business in Adams would benefit from the ski and resort business, and the area lawmakers, plus the Mohawk Trail Assn. And various tourist and trade groups and the all-powerful Reservation Commission, it looks pretty certain that skiers will be riding up some sort of lift within the next two to five years. " " The mountain's potential is still a powerful lure for aspiring developers. The Mount Greylock Tramway Authority, for instance, has for the past four years been attempting to sell, without luck, bonds to construct a $2.7 million ski resort, complete with aerial tramway on the mountain. Staunch factions for and against the tramway have sprung up. " " 1964: Tramway Authority unveils plans for $5.5 million tramway on the east side of Mount Greylock. Project includes tram, chair lifts, 11 miles of ski trails, an "international shopping center" and an amusement park. Mount Greylock Protective Association files suit. 1966: The Mount Greylock Protective Association wins legal challenge, and the Tramway Authority is abolished by the Legislature. 1967: North Berkshire Area Redevelopment Authority issues plan for recreational development at Mount Greylock. A golf course and hotel planned on Glen lands. The facility is never developed. "